Boy meets girl. Boy falls in love. Girl doesn't. 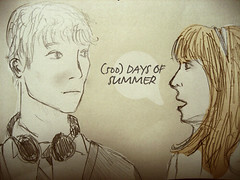 I travelled to Vue Cinema, Greenwich (O2) this evening to watch the post modern love story (500) Days of Summer. Just like Tom (Joseph Gordon-Levitt) I also became blindsided when I separated from my long term partner and tried to figure out where it went wrong. Tom believed that Summer (Zooey Deschanel) was 'the one' but when they seperated he began a journey to rediscover his true passions in life. Like the character I shifted back and forth through various periods of when we were together looking for answers. Our entire history is documented through different social networks and media, the rise of instant communication technologies made possible through use of the Internet have changed how we build relationships. We are a transparent generation, but should we be? The boundaries we impose online, the people we interact with and the content we share. Do we really know anyone personally anymore, have we all just become brands?! (500) Days of Summer constantly reminds us that the two characters are different people with different ideas of a relationship. There are some beautiful moments in the movie and I was able to relate and find perspective. This is something I have lacked lately although I expect it will be a distance before I reach a conclusion! Amidst the demise of the relationship are three children, I have been in this position before when I separated from the older children's mother. The difference here though is that I'm not the biological father of the youngest involved. It's not an amicable separation either and this means I have been prevented from any form of contact. I have found it really difficult because I raised her and the bond we shared is what any father has with their daughter. I don't want to right-click and delete everything because I care about her considerably as do the older children. I know that she will forget everything in time because of her young age but I won't and neither will my children. This is due to the fond memories and extensive history available through social networks and media. Providing a snapshot of when the pieces of the puzzle weren't so complicated!